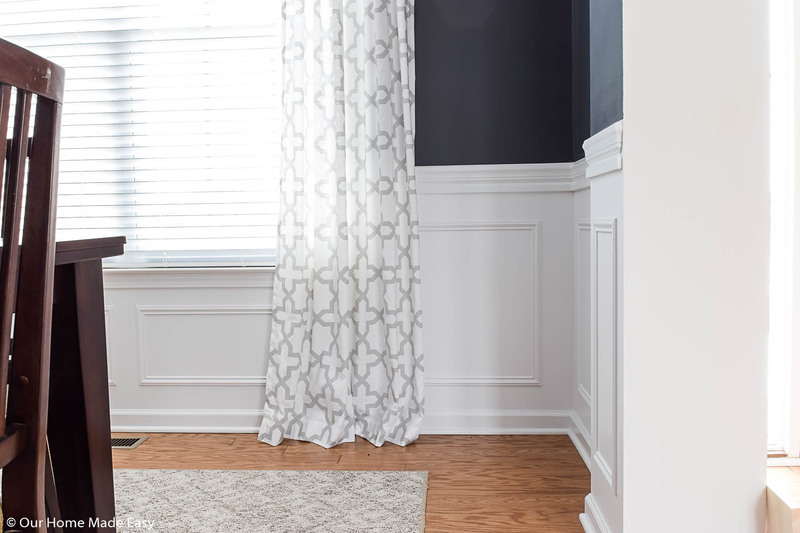 Deciding wainscoting vs board and batten? Here are the biggest differences between the two and which is the best option! Already love the Board and batten style? Make sure you read 11 things to know before you install your own board and batten! When we built our home more than 5 years ago, it came with an absolute blank slate. Almost zero character. Zilch. Nada. Over the past few years, we’ve added character by adding both traditional wainscoting and board and batten wall treatments. Both have turned our Michigan home into something that looks less “cookie-cutter” and more custom. The best part? 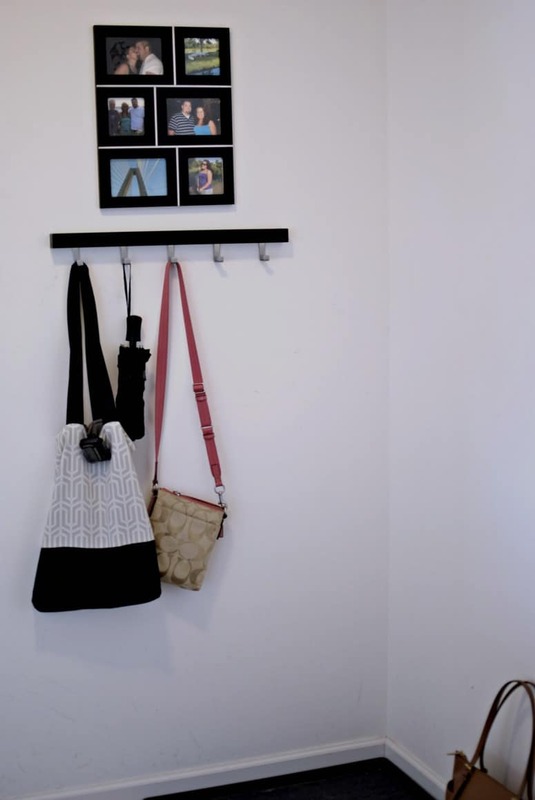 They were both relatively easy and inexpensive to do! All we had to was invest in some planning time & sweat equity. 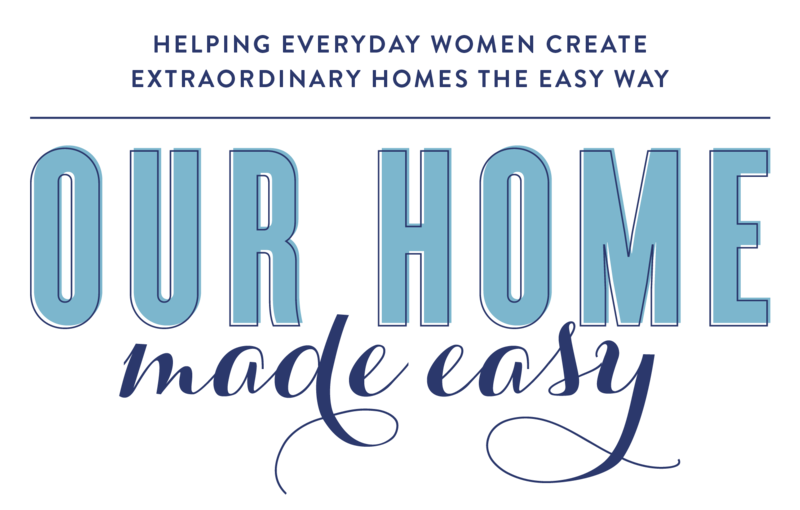 As DIY lovers, we like to choose projects that have a high impact but don’t require more time than the average weekend DIY warrior can handle. And both wainscoting & board and batten met those requirements! 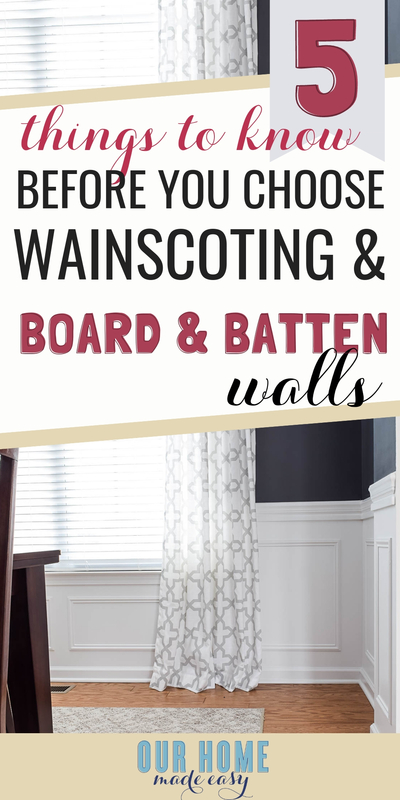 Have you considered choosing wainscoting vs board and batten, too? If so, I wanted to share some things to consider before you choose one over the other! Let’s talk about the obvious one! 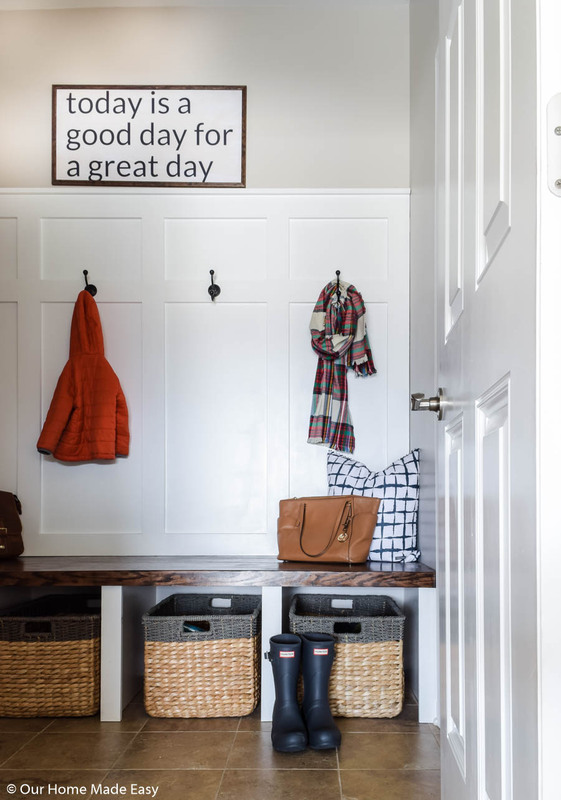 When you’re deciding wainscoting vs board and batten, you need to consider your own personal style. Are you more of a traditionalist? If so, you may love wainscoting. 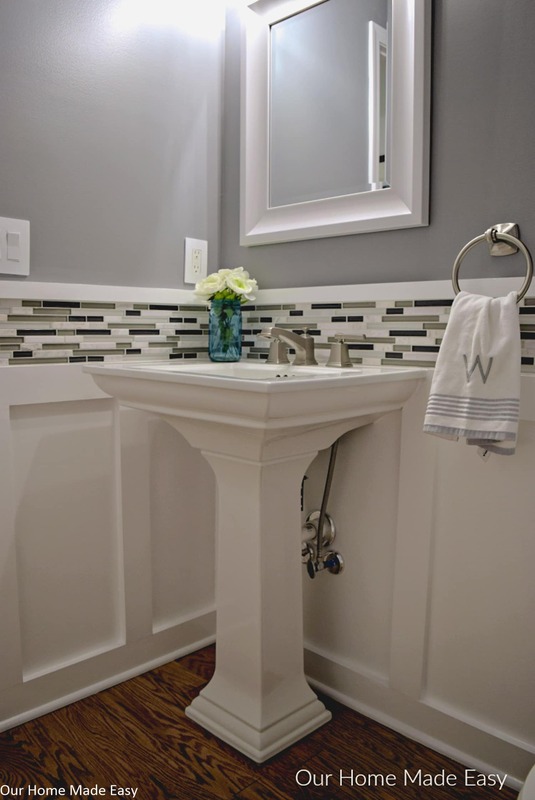 Traditionally, wainscoting consists of a square or four-sided frames to build a wall treatment. You can choose whether to place a solid board against the drywall under your frames, or you can do what we did— build your four-sided frames directly nailed onto the wall. Do you love the rustic or farmhouse style? Board and batten may be your easy choice. Love being modern? You can still use board and batten! 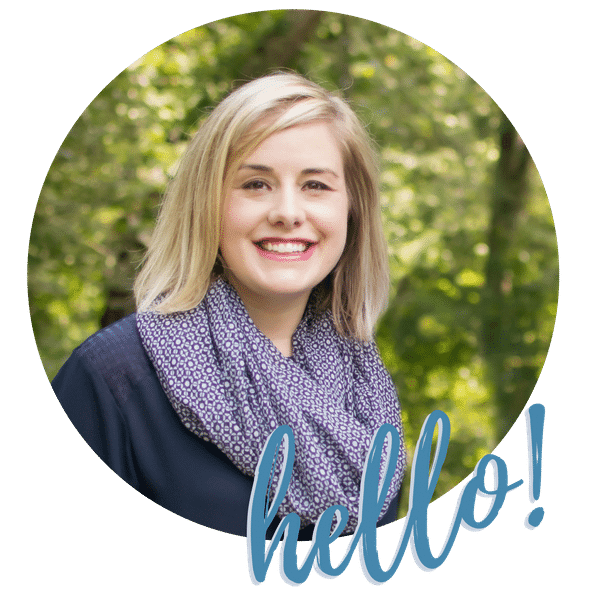 My friend Christene shares how to modernize it without any farmhouse feels here. And it doesn’t need to stay bright white. 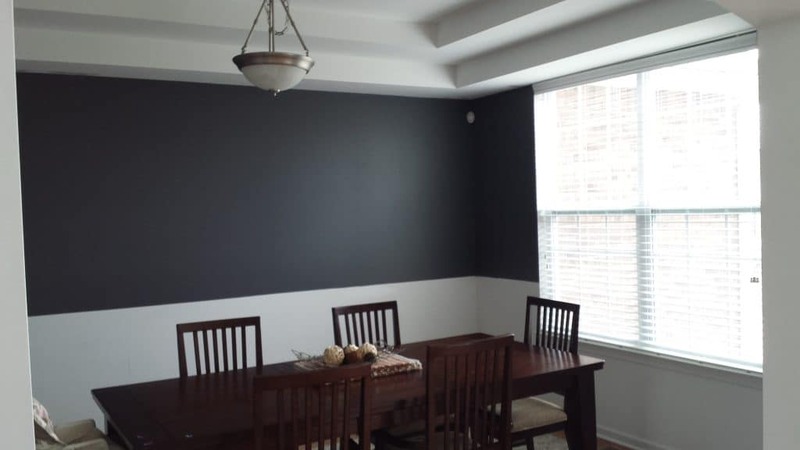 You can paint your board and batten walls a moody, deep color to add lots of interest without overwhelming a space. Thrifty Decor Chick was the original one who did a board and batten accent wall years ago! Isn’t it beautiful? In 11 Things You Need to Know Before Making Board & Batten Walls, I talked a little about how to determine how much board length you’ll need. For wainscoting, you’ll want to look at your wall width and determine how many frame boxes you will need. Once you determine how many boxes you need, you’ll want to look at how much space you want in between each frame and your width dimensions. For our dining room, we measured up from the bottom for the start of our boxes. Then, we kept them the same height across all the walls to keep a straight visual line. Since our window dipped low into the wall, we kept the bottom frame the same distance up but shortened the height. To make it look visually appealing, we kept one frame on either side of the window and two short-ys under the window. This kept everything looking visually appealing throughout the entire room. How much do you want to spend on your next project? Now that you’ve completed your math, it’s time to figure out how many materials you really need. If you’re considering traditional wainscoting, you’ll need to figure out if you want 1-2 pieces of chair-rail stacked on top on another. Then, you’ll want to choose your moulding for the frames. While select pine boards can add up, you’ll likely find that you’ll spend more in decorative moulding for a similar sized room. 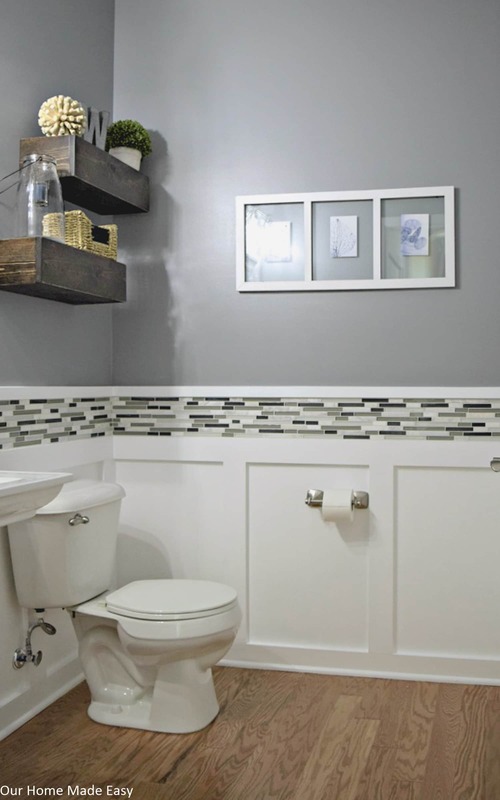 Before you start any wall treatment project, take a look at your walls. If you have flat walls, you can usually DIY and skip the wood board underlay. If you pretty straight walls, you should be able to board and batten relatively easy. You’ll fill in any gaps with paintable caulk. 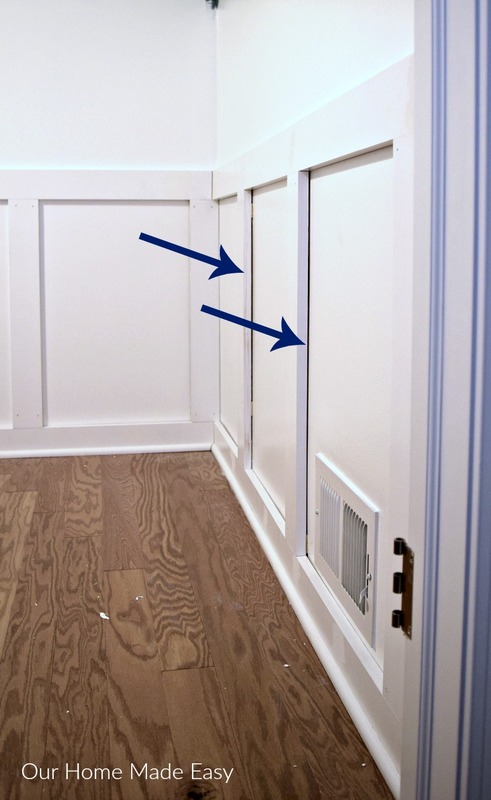 However, if your walls aren’t super straight, you can bend the molding from the wainscoting a little bit easier. Those pieces are usually thinner and more flexible compared to select pine boards. When it comes to skills, we are talking about combining your math and DIY skills. Do you prefer to keep something simple? You’ll prefer board and batten. Do you find making mitered cuts pretty simple? Then you won’t mind traditional wainscoting. Aside from making each cut with your saw, you’ll find that both are pretty comparable in skills. 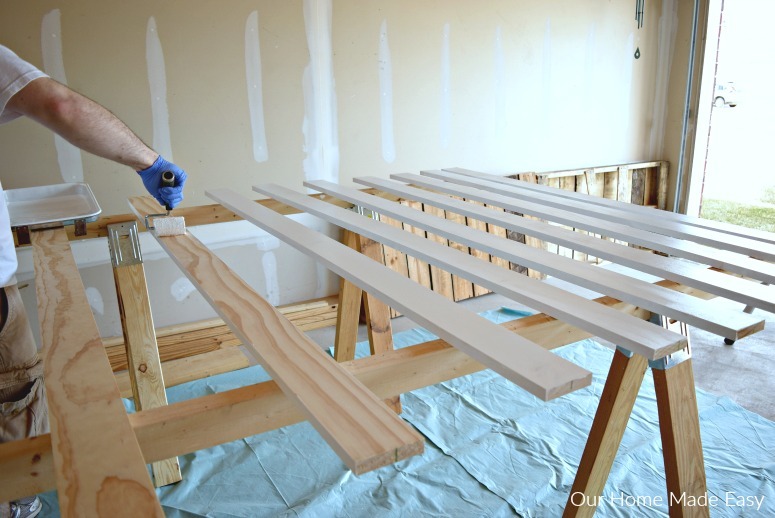 You’ll use a pneumatic nailer to attach the pieces to the wall, you’ll fill in the holes, caulk, and paint. Pretty comparable, but on a whole, board and batten is less challenging. 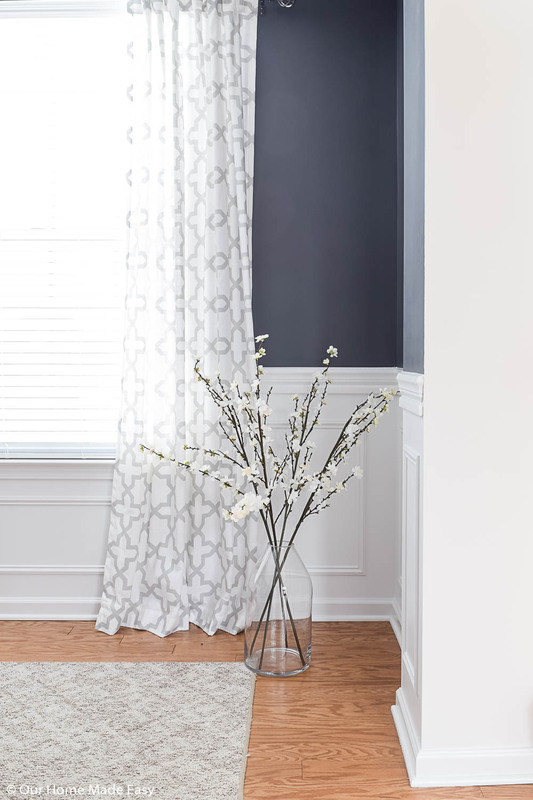 Adding wainscoting or board and batten is a great way to add character to your home for a relatively small cost! 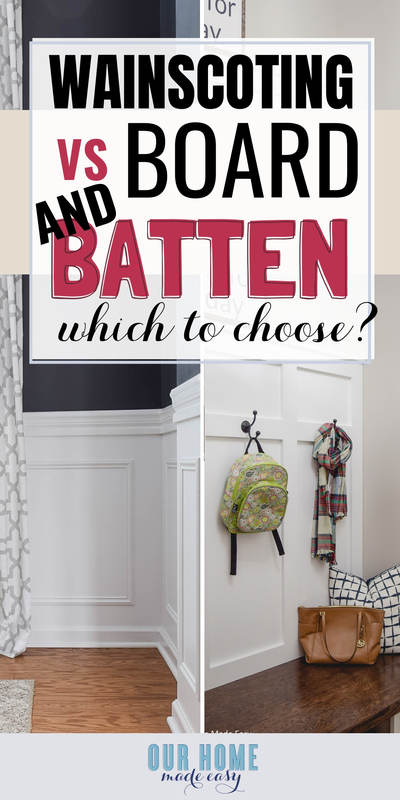 Deciding between Wainscoting vs board and batten shouldn’t be hard to choose when you start thinking about what you works best for you! Choose the one works best for your style and skill level. 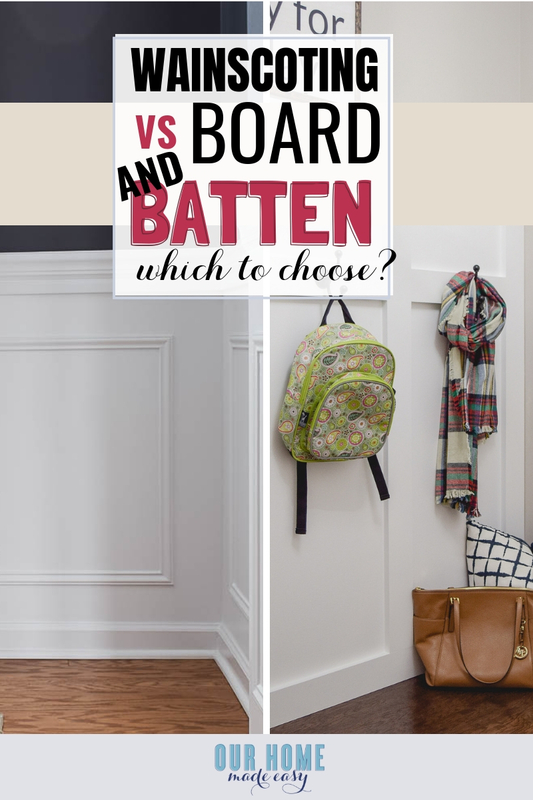 Have you ever chosen wainscoting vs board and batten? Tell me why you chose it in the comments! Your work on the house is beautiful. I am looking forward to putting up the Board and Batten or Beadboard to cover up some awful texture from 1979. Could you please tell me the make and color of the white you used. It is exactly what I need to brighten up the walls that are off white, and makes the house dark and dingy looking to me. Thank you ! Thank you Gabby! We used an untinted pure white base from Behr! Good luck with your project! 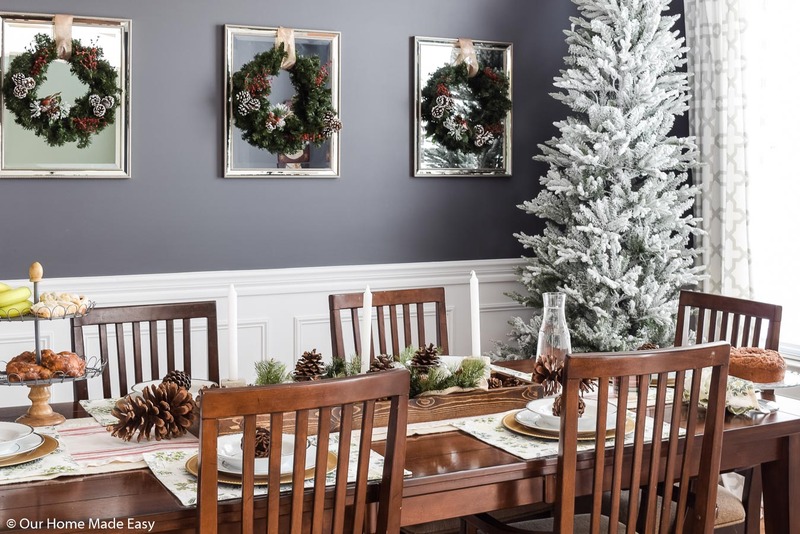 Thanks for including our dining room board and batten here! 🙂 Wall treatments are a totally underrated way to change a builder basic house into something more custom.